By ADELE PETERS in Fastcompany.com on August 10, 2017. 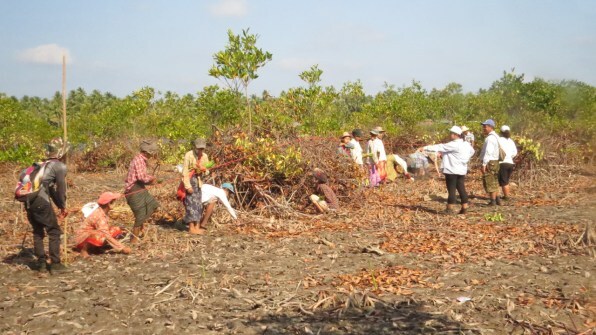 For the past five years, a group of villagers in the delta of the Irrawaddy River in Myanmar has painstakingly planted 2.7 million mangrove trees in an attempt to begin to restore an ecosystem that has been disappearing for decades. But the work is laborious, and the local nonprofit guiding the work wants to cover a much larger area–so they’re now turning to tree-planting drones. The drone technology works in stages. As a first step, mapping drones fly more than 300 feet over the land, collecting detailed data about the topography and soil quality. An algorithm uses that data to choose the best locations to plant trees, and the best species to plant. 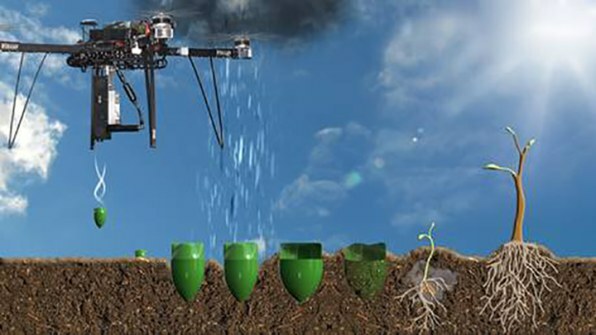 Next, a second group of drones, flying low over the ground, automatically follows the map to plant seeds in custom, nutrient-filled “seed pods” designed by plant scientists to support each species; each drone can carry a mix of different species simultaneously. The drones fire the pods quickly enough to penetrate the soil. 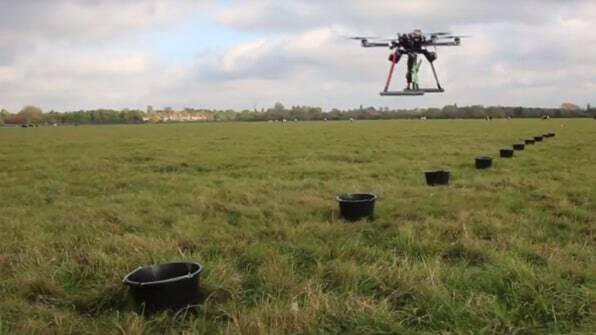 It’s technically possible for a single drone pilot to oversee six of the drones simultaneously, reaching the maximum of 100,000 plantings in a day, though drone regulations in some countries require a pilot for every drone, making the process slightly slower. The drones are at least 10 times faster than humans planting trees by hand, while the process can cost half as much. 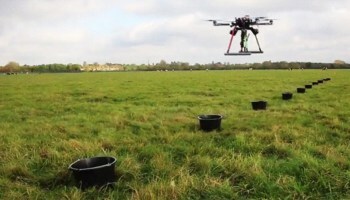 The startup began developing the technology in 2015, and though the founders won’t share many details about how it has evolved–explaining that competitors are trying to copy them–they say that they have successfully tested the process on test plots in the U.K. and in Australia, where they used a seed-spreading drone to plant trees at an abandoned coal mine. In the U.K., where the test plots have been in place for more than a year, the trees are showing good rates of survival. “[Survival rates are] definitely much better than spreading from a helicopter, which many people use,” says Fedorenko. “In some species, it’s comparable with hand planting.”In Myanmar (also known as Burma) the technology will be tweaked to best handle local conditions. Mangrove trees grow in brackish water along coastlines, so the drones will have to successfully shoot the seed pods underwater. Mangroves play several roles in the area. The roots filter the water and create a tangled, protected network where fish can live. 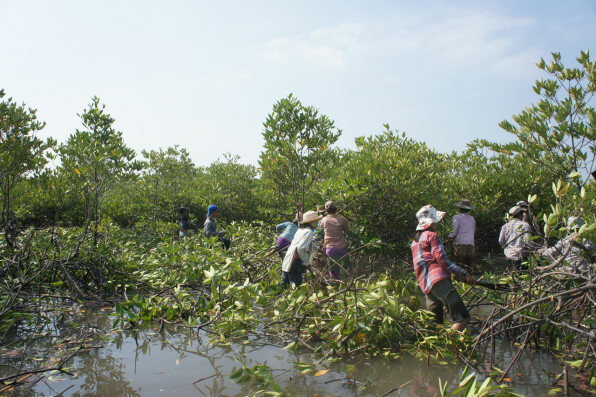 As the trees have been cut down to make way for rice or shrimp farming or used for fuel–75% of the local mangrove cover was lost by the 1990s–the local fishing industry has seen fish stocks plummet. The trees also protect the coastline from storms. In 2008, when a hurricane hit the area, killing at least 138,000 people, the damage was likely much worse because of deforestation. “We are now racing against time to rebuild the green shield in order to protect the most vulnerable people living in the coastal zones before another massive storm hits them again,” says Bremley Lyngdoh, a board member at Worldview International. Mangroves also play a role in fighting climate change; an acre of the trees can sequester several times more carbon than the same area of undisturbed rainforest (on the flip side, cutting down mangroves also releases a huge amount of carbon). Recognizing that there is still economic pressure to cut down the trees, the team is considering the possibility of creating an agroforestry project–rather than planting trees alone, combining trees with crops that locals can use as an income source. “The foundation wants to guarantee that after the ecosystems are restored, people have the incentive to actually keep it and care about it,” says Fedorenko. By protecting the coastline, the trees can create an environment near the shore where certain salt-tolerant crops could grow, such as species of salt-tolerant soy or rice. Worldview International and BioCarbon Engineering have also partnered with Route2, a London-based company that plans to create a system for valuing the “ecosystem services” of the project–from carbon sequestration to protecting fish populations–and then create credits for those that can be sold. “The goal is to make a standing tree more valuable than cutting a tree down,” Fedorenko says. The project was one of the winners of the 2017 BridgeBuilder Challenge, a competition sponsored by the GHR Foundation and hosted on OpenIdeo, a collaborative innovation platform. The foundation awarded the project $242,800 to plant the trees, monitor and report on their progress, and calculate the ecosystem services. (BioCarbon Engineering has previously received investment from the drone company Parrot and the accelerator Founder.org). The project could later be expanded to meet Worldview’s goal of planting a billion trees, and could also be replicated elsewhere. “If [it can be] financially sustainable…that will be huge for pretty much all the tropical areas around the world,” says Fedorenko. “Every country that has mangroves will be able to replicate the example, all around the equator.”BioCarbon Engineering plans to continue developing its process for other ecosystems, working with partners to help plant and financially sustain new forests that are needed for the planet to have a chance of meeting the goals of the Paris climate agreement.